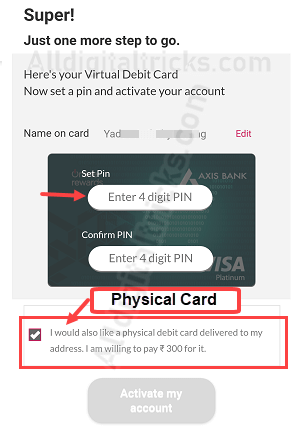 And here we will tell you the step by step process – How to open Axis Bank Zero Balance ASAP saving account in just 5 minutes at home, no branch visit required. 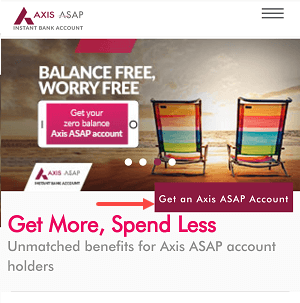 About Axis Asap saving account, it is zero balance saving account and you don’t need to keep MAB (Monthly Average Balance) in your account. You can keep your account active even, you have zero balance. Follow below steps and open Kotak Asap saving account instantly. 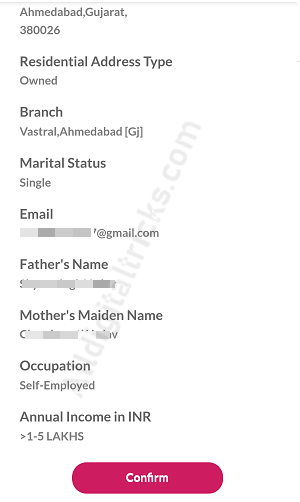 All you need, Aadhaar card number, Aadhaar registered mobile number and Pan card. 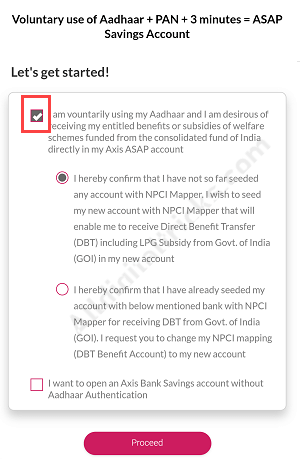 (2) On the next screen, select Aadhaar option “I am voluntarily using my Aadhaar and desirous of receiving….”. After selecting the Aadhaar option, the next two option opened for DBT customers. (If you are receiving DBT then it will be transferred in ASAP account if you are not receiving any DBT then select any option). (3) Now enter your Aadhaar registered mobile number, Aadhar number, PAN number and click next. 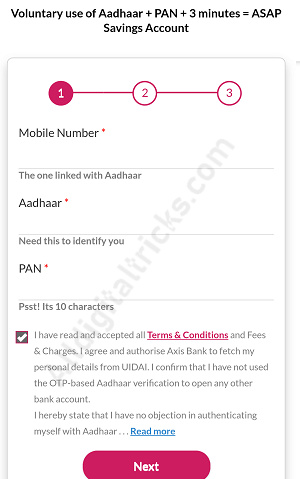 Now you will receive OTP on your Aadhaar registered mobile number, enter this OTP on next screen and click on next. 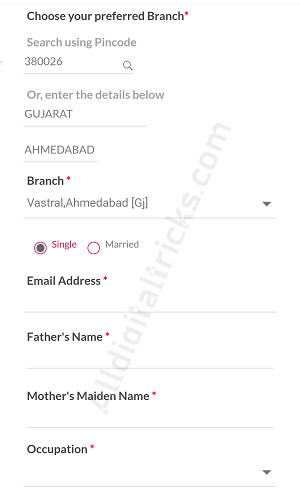 (4) Now select your preferred branch in your city, enter your email address, father name, mother name, occupation and submit. 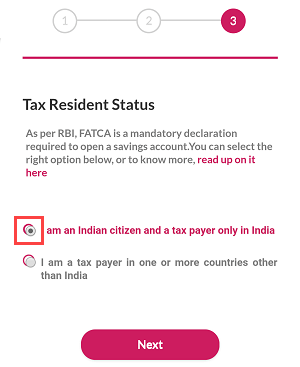 (5) in FATCA declaration, select I am an Indian citizen and a taxpayer only in India and click next. Almost ready, now confirm your filled details and click on confirm. 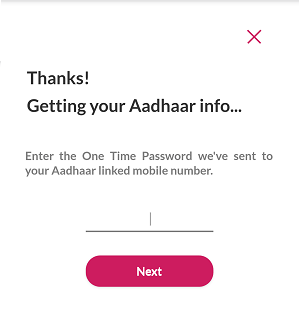 (6) And now you will receive OTP on your mobile number, enter OTP and click on next. (7) And finally, set a 4-digit PIN for your virtual debit card and click on Activate my Account. You can also apply for the physical debit card, select I would also like a physical debit card. Congratulations, your Axis ASAP saving account opened successfully. You can see your ASAP Account number, Virtual Debit card. An email also has been sent to your email address with all details. You can also fund your account, just click on Add money, else skip it. You can also activate Axis Bank net banking facility to access your ASAP saving account online. Please note: You can credit a maximum of Rs.2 Lakhs in this account and post which you will need to convert to Full KYC account. The validity of this account will be 1 year, within which you will need to convert this account to a Full KYC Account. Converting to a Full KYC account will also remove the transaction limits from your account. You can visit the nearest Axis Bank Branch to switch your account. Bank customer executive will authenticate your Aadhaar details using a biometric device. 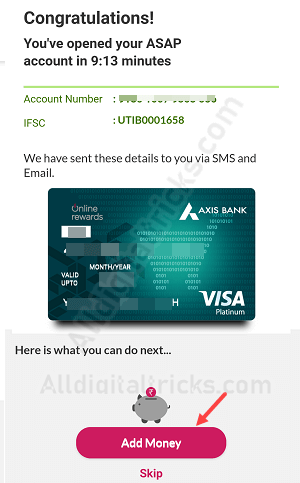 So this is how you can apply for Axis Bank ASAP zero balance saving account online. You don’t need to keep MAB in your account.